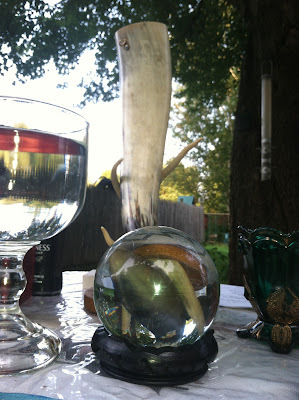 We spent Saturday with my grove mates to celebrate Lughnasadh. It was wonderful to see them after staying with my family for the Summer Solstice. We held our traditional Lughnasadh games! They were more low-key and less structured this year. We had other activities planned this year and the heat was oppressive this weekend. We spent a lot of time, including our business meeting, just floating around the pool. 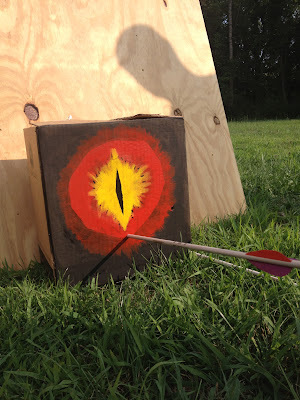 The games we did have included archery, spear throwing, and Kubb. Because nobody was really keeping track, we didn’t declare a champion this year. Instead, everyone who participated charged a wreath which was given as an offering during ritual. This year included a special women-only ceremony for one of our younger members, Dragonfly. We welcomed her to womanhood and shared our words of wisdom and wishes for her. It was very lovely and well-planned. I know that, if I have a child, I would very much like for them to have a coming of age ceremony. I know I would have liked something like that. What I liked best was that it was very personal and not connected to a spiritual mandate of some sort. It was all linked to physical changes and her life. In addition to games, our Senior Druid felt it important for the artisans to show their work as well. We did not compete – simply shared some of our recent work. 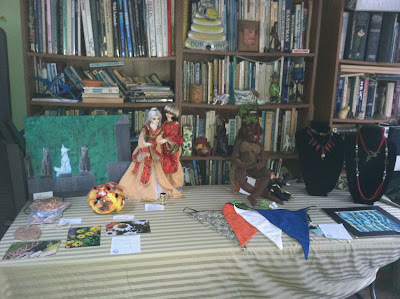 Painting, sewing, ceramics, sculpture, drawing, photography, and jewelry making were all represented! 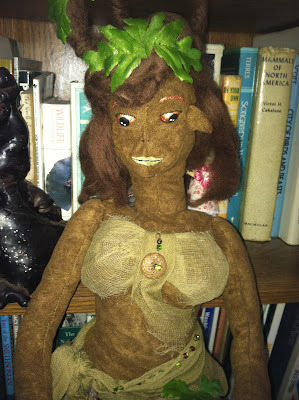 One of my more recent dolls – “Dryad.” Photo by Grey Catsidhe, 2012. 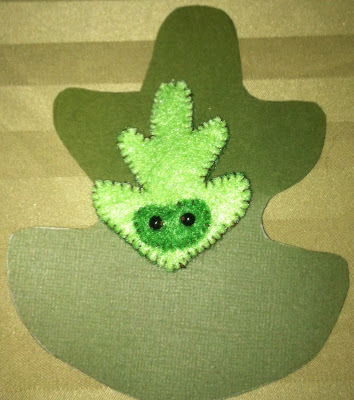 One of my “Wee Greenman Pins.” Photo by Grey Catsidhe, 2012. Our ritual was held in the shade of several trees behind our hosts’ home. As the sun set, the air became less stifling and we focused on the cooling waters our bodies and lands so crave. At the same time, we acknowledged the searing truth that is high summer and the lessons it teaches. We praised Lugh as champion – as the many-skilled one who inspires us to reach for our goals and work hard each day. We thanked the Nature Spirits for the harvest. 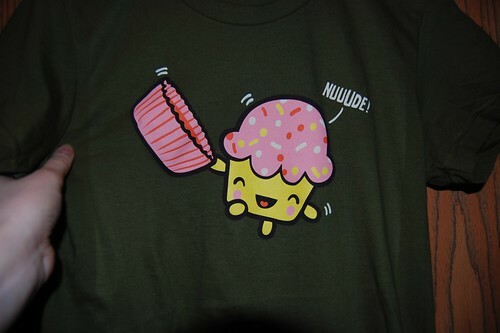 After that – we feasted! It was a good day with wonderful people. I’m looking forward to the Autumn Equinox already! Photo by Grey Catsidhe, 2012. Hail to the Nature Spirits, source of the grain harvest! We thank you for your bounty. 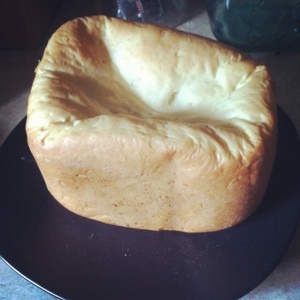 Having made some bread, I’m off to bring the heal to the forest shrine as an offering of thanks. I gave an offering of whiskey to Lugh this morning and am going to have a game night with my neighbors this evening. Looking to be a wonderful Lughnasadh with friends! Since it will be a full moon this evening, I’m hoping to do more work before bed. It’s a good time for it – very auspicious! The big celebration will come Saturday with my grove. We’ll be having our traditional Lughnasadh games complete with caber tossing. Always a fun time! Divination + Video Games + Super Bowl = Geeky Techno Pagan Jock? I’m on vacation. I can kick back and relax. I can sew and have fun! That’s just what I did today. 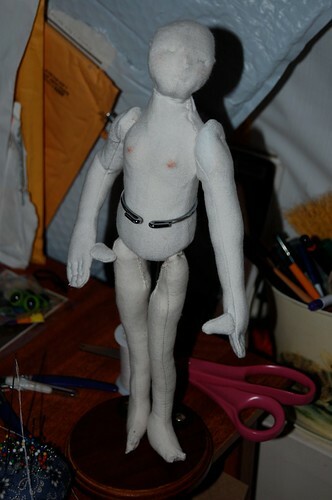 I worked on a small doll. I don't really like the arms and may end up redoing them... Otherwise I'm very pleased with the pattern I came up with. 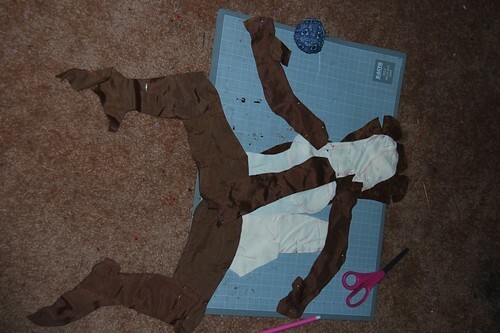 I started another, larger doll. I apologize for the quality of this photo. I'll try to get a better one soon. 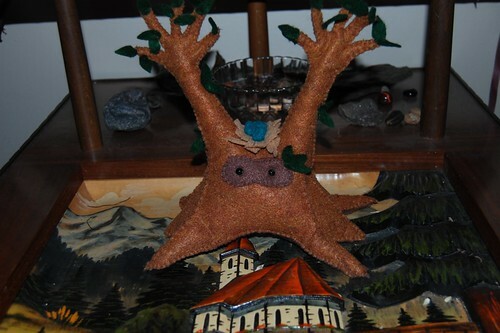 Here is my latest tree spirit plush! She has newly budded leaves and a robin nest on her head! 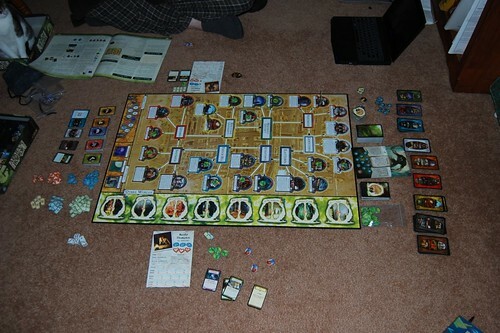 My husband and I finally got around to playing Arkham Horror, an occult delight from the Lovecraft universe. It's complicated, takes forever to set up, is looooong, and a challenge. We didn't even finish but it is a lot of fun. I had a lovely day! I’m off to do my devotional before bed. Tomorrow? I hope to attend an Earth Day event, take care of some errands, and get my monthly massage! Huzzah! Saturday was Earth Hour. It was the third year Weretoad and I participated. A lot of people complain about it being a pipe dream with little impact, especially this year. Since we’re already environmentalists and go beyond the hour anyway, I feel that even one more little step can make a difference. I think it would be fun to do it with other people in the future. Maybe have a candlelit potluck dinner? I would at least feel less isolated! Anyway, my husband and I enjoyed it this year. 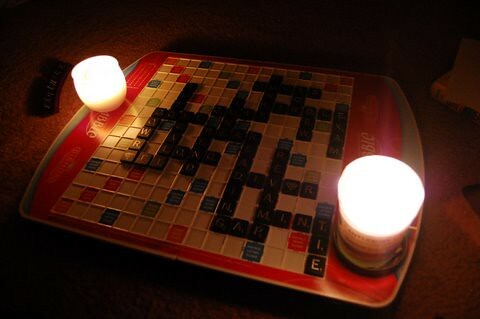 I meditated for a few minutes and then we played Scrabble with candles. Well, not too sick. Just congested and lacking in sleep as a result. The usual meditation and the like are nigh on impossible for me in such a state. Focusing on my breath only makes me miserable. Last night I toyed with some Guitar Hero and found myself focusing on drum beats. (I don’t do the guitar… I’m a percussion kind of gal when it comes to those games.) The longer the song and the more basic the drum beats, the more I felt on the threshold of trance and the less I noticed my congestion. The nature of the game didn’t allow me to really reach trance, but the nearness and the ability to distract myself from my woes was welcomed.